Bidmix's Bughunt is one of THE most original in terms of gloom maps. 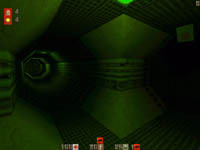 The map is composed of rooms all connected by green lit corridors that unlike in other maps these corridors gave you the "scared shitless" feeling. The map was on a couple floors with more than one way to access each others bases. The map contains a really cool and innovative feature: Locators. The locators tell you where the life forms are so you can quickly "mop up" any resistance. The map also contains air ducts only accesible by drones and hatchies, it makes for a quicker and safer route for low level spider players. The revised version contains new sounds and textures as well as Quarantine signs on the non-functioning doors. Schematics for the map are also in there. Comment: Grab it as quickly as possibe! This review has been read 1117 times. The Gloom Map Depository is copyright Team GMD. Quake2 is a registered trademark of Id Software. Gloom is copyright Team Reaction. The review script is copyright R1CH.